A native of the Olympic Peninsula and a current Port Townsend, WA resident, Jesse has a long history aboard Adventuress. He last sailed across the Atlantic to Morocco as an apprentice on the square rigger Picton Castle. Prior to that he was Second Mate on Lette G. Howard and Winter Mate on Clearwater. Jesse recently discovered an amazingly abundant spot for finding chanterelle mushrooms—and he is determined that its location shall remain a closely guarded secret. You can still try and ask him, though. Jenny currently lives in Bellingham, WA. She received her bachelor's degree in Environmental Education from Western Washington University and last worked as the Teen Program Coordinator for the Boys and Girls Clubs of Whatcom County. She also used to be part of a competitive performance jump rope team—and we hope that she'll share some of her jump rope skills on deck! After graduating from the Seattle Maritime Academy in 2000, Merlin joined the Marine Fireman’s Union and worked in the engine room on container ships for 12 years. He has his engineering license and has also worked with Washington State Ferries and the Alaska Marine Highway. Most recently, he sailed with NOAA. Raised in Port Townsend, WA, Kellen has been professionally feeding his town for the past 4 years. Now aboard Adventuress, he will prepare three vegetarian meals a day for all crew and participants. A graduate of the Seattle Culinary Academy, Kellen is continuing his education on the Salish Sea with the intention to return to school next year for a degree in Energy Policy. Orion lives in Port Townsend, WA. He recently got his associate’s degree in Wooden Boat Building. A fun fact about Orion is that it takes him approximately 30 seconds to fall asleep or wake up—ideal for Anchor Watch stints on Adventuress. Returning this year after several seasons as a Deckhand / Educator, Gaia grew up on San Juan Island watching Adventuress sail in her backyard. She graduated from Fairhaven College with a degree in Human Ecology and Sustainable Food Systems and has also worked with the Soundwatch Boater Education Program and the Whale Museum in the San Juan Islands. Arthur is from Brattleboro, VT, and has a bachelor's degree in Geology from Oberlin College. He recently worked at the Adam J. Lewis Center in Oberlin, OH, where he monitored and maintained the Living Machine Wastewater Treatment Facility, which is designed to mimic wetland ecology. During a SEA semester, Arthur sailed from New Zealand to Tahiti using celestial navigation. Laura calls New York City home. She has a bachelor's in Geology from Carleton College and last worked as an educator at the The Leadership School at Kieve, where she facilitated leadership activities for middle school students. She has also biked across the United States. Elena is from Pullyallup, WA, and has a bachelor’s degree in Environmental Science from Western Washington University. She last worked with The Nature Conservancy in North Carolina as a burn crew member preserving and restoring longleaf pine forest habitat for native wildlife, especially the endangered red cockaded woodpecker. Elena is a baking enthusiast. Sarah currently lives in Saunderstown, RI. She has a master’s degree in Oceanography from the University of Rhode Island. As a graduate student, she maintained the Narragansett Bay Phytoplankton Time Series, one of the longest running time series in the world. She also plays the viola. Andrew is from the Seattle area and is currently majoring in Marine Biology at the University of New Haven in Connecticut. He was recently a youth volunteer at the Seattle Aquarium and he loves to play Ultimate Frisbee. Laurie lives in Bellingham, WA, where she works at Whatcom Hills Waldorf as an Office Data Wrangler and Teacher's Assistant. She can write forward and backward with both hands. Julia is from Lincolnville, ME. She has a bachelor’s degree in American Studies and Community Health from Tufts University and recently worked as a science teacher at Knox Central High School in Knox County, KY. She’s proud of the fact that John Legend once told her that he loved her (she was cooking cheese crackers for him at a catering event). Lizz is joining the Sound Experience community after graduating from St. Lawrence University with a bachelor's degree in Environmental Studies and Outdoor Studies. She is originally from Harpswell, ME, but has called the Adirondacks and North Country New York home for the past four years. She is excited to no longer be landlocked. Her spirit vegetable is a beet. Thom is from Columbus, IN, and is currently studying Environmental Education at Warren Wilson College. At Warren Wilson he worked as part of the Pig Crew on the College Farm, raising and providing the best possible care for 3 boars, 20 sows, and up to 150 piglets. Zoey currently lives in Tukwila and works at the Seattle Aquarium as a Community Engagement Specialist and with Bright Horizons as part of the support staff. She will be aboard Adventuress for the month of August. Annarose is a student at UC Santa Cruz and is about to start her third year in Community Studies. She is aiming for a graduate program in documentary filmmaking and plans to continue working towards a maritime license after college. For the past few summers she has worked various positions aboard the schooner Mary Day. As a kid, Annarose hoped to someday keep a pet hermit crab, but now she is always glad to see them living footloose and fancy free on beaches and in tidepools. Josh grew up in the Seattle area and currently lives in Israel, where he is in the middle of getting a degree in Computer Science and Business from the Hebrew University of Jerusalem. He recently worked as an interning software developer at the Seattle software firm "Z-Firm," building a website to host a database of testing data. He enjoys slowly discovering the Pacific Northwest (and someday the rest of the world) during long solo rides on his motorcycle. Nate grew up in Port Townsend and is returning to Adventuress this year as Season 1 First Mate. He received his 100 Ton Inland Master’s license in 2012. Most recently, he was working for the Center for Wooden Boats as a sailing instructor and assistant boatwright. In his spare time he likes to build bikes. 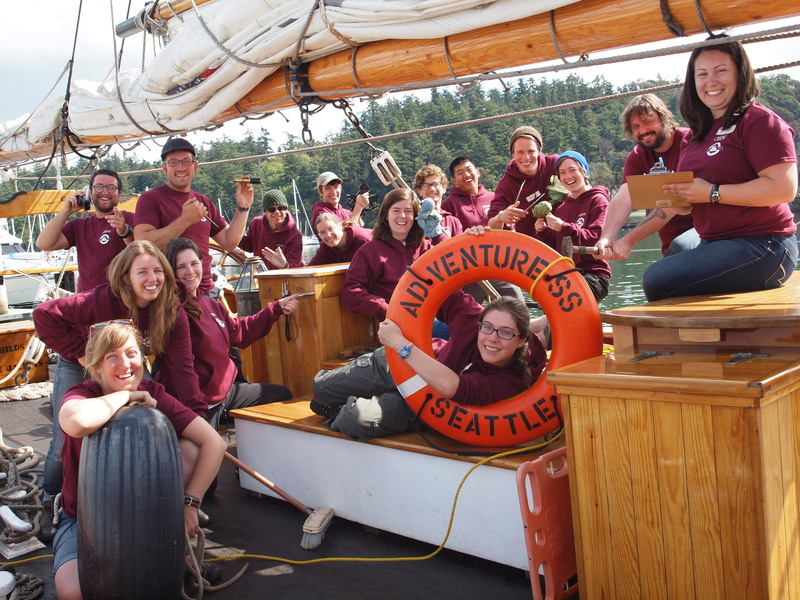 When she’s not aboard Adventuress, Rosie calls Seattle home. She recently completed the Scientific Illustration Certificate Program at UW Seattle. Her most recent job was with the Environmental Science Center, located in Burien, where she worked as a Salmon Naturalist getting kids excited about exploring salmon habitat. And if no one ever intervened, she might spend all of her time embroidering, covering every inch of her clothes with stitched plants and animals. Marshall joins us as Season 1 Engineer. He calls Sacramento, CA home. His most recent job was as engineer aboard Hawaiian Chieftain. Josefine’s first time sailing on Adventuress was twelve years ago. She has been on several programs since then, and in more recent years has come aboard as a crew member. She returns again this year as a season-long Second Mate after receiving her B.A. in History from Bates College in Maine. Her most recent job was as Bosun on Hawaiian Chieftain. Kathryn Hoerauf will always call the Pacific Northwest home, but for the past few years she has been soaking up the sun in New Mexico. She recently earned her B.A. 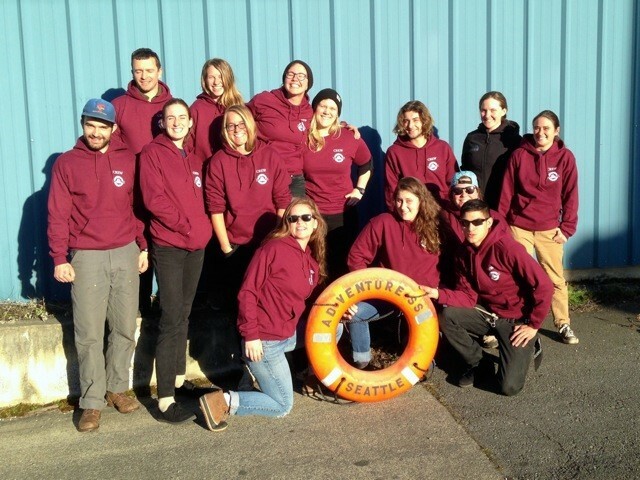 in Outdoor Recreation from Western Washington University, with an emphasis on the natural history of the Pacific Northwest. She joined us for a month-long internship in 2015, stayed on as a winter crew member, and is back on board as half-season Galley Coordinator. Nelson, born and raised in South Puget Sound, calls Olympia home. But that didn't stop him from traveling east over the Cascades to attend Whitman College, where he graduated with a B.A. in Environmental Humanities. Shortly thereafter, he served as an AmeriCorps member and Environmental Educator at the WET Science Center in Olympia. At the science center (which is attached to a wastewater treatment plant), he taught children and adults the wonders of clean water, marine life, and poop. Nelson's personal hero is the late astrobiologist/astrophysicist Carl Sagan, who taught us that "we are all made of starstuff." Originally from Massachusetts, Becky graduated from the New College of Florida with a concentration in Chinese Language and Literature. While working on a small farm in northern California, she fell in love with the Pacific Northwest and its unique ecosystems. When not on the West Coast, she has had the privilege to live and work in many places, including Detroit, Maine, and countries in Africa and Southeast Asia. She is passionate about medicinal plant conservation, growing food, and singing. Paul Blatt comes to us from Brooklyn, NY. His recently earned a Vessel Operations Vocational Diploma from New York Harbor School. His most recent job was for Entertainment Cruises NYC as their First Officer. He loves playing bass. Kelly Greenwood hails from New York. She recently earned her B.A. in English and Environmental Studies and has been working for Northstar in California as a Ski Instructor. Last fall Kelly completed her life-long dream of climbing Half Dome in Yosemite. Sara come to us from Cary, IL. She recently received her B.S. in Fish, Wildlife, and Conservation Biology from Colorado State University. Most recently, Sarah has been working for Colorado State University’s Larval Fish Lab as a lab technician. A fun fact about Sara is that she once swam with sharks. Colleen O'Brien is from Chardon, OH. She has a degree in Marine Science/Biochemistry from Eckerd College. Before coming to Adventuress, she was at the American Conservation Experience doing ecological restoration and trail-building projects throughout the Southwest. She enjoys hiking and trail-unicycling in her free time. Benjamin Geffken hails from Boston, MA. He just finished Home-school High School. His most recent job was at Courageous Sailing Center as a Sailing Instructor, where he taught dinghy racing and cruising in Boston Harbor. He enjoys writing poetry in his spare time.